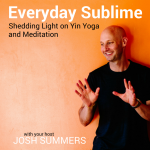 Interviews on Josh Summers' podcast, The Everyday Sublime: Shedding Light on Yin Yoga and Mediation. The therapeutic encounter between a practitioner and patient is, in many regards, the most important part of a healing relationship. This encounter is another way of referring to the placebo effect. But far from being ineffective, all good healers try to maximize this effect. According to Dr. Daniel Keown, acupuncture is one of the most sublime forms of the therapeutic encounter. What is Qi? What are the channels of Chinese Medicine? What is fascia? These questions and more are taken up by Dr. Daniel Keown, explained with lucid brilliance. For anyone interested in Chinese Medicine, this is a must-listen. Talking about difficult topics is not easy. Often we get trapped in patterns of reactivity and experience a clash of viewpoints. Oren Jay Sofer offers ways to move past through these impasses in learning how to identify the underlying needs being expressed – the needs that connect us to our shared universal human longings. From this sense of connection, collaborative dialogue becomes possible. All too often, meditation is seen as a panacea for all that ails us. But meditation practice alone is not necessarily enough to smooth out the strife in our interpersonal conflicts. For this we need training in communication strategy – ways to escape the blame game and move towards a deeper understanding of shared needs and goals. In this episode, Oren Jay Sofer lays about a mindful approach to nonviolent communication. I talk with David Lesondak about his new book, Fascia: What it is and why it matters. David is rapidly becoming a rock star in the fascial world, having extensive work in structural integration, as well as having attended and presented at many of the Fascial Congresses.